Universities plan to offer financial incentives to attract the brightest students regardless of family income, the president of Universities UK says. Sir Steve Smith says reforms allowing institutions to take on unlimited numbers of top students next year will create competition for the brightest. Institutions risk losing funding if they attract fewer top pupils than now. Ministers insist there will be tough new criteria for attracting A-grade students from lower income backgrounds. Sir Steve, the outgoing president of Universities UK - the body representing UK universities - said the government had introduced a market for A-level students with the best grades. He said they might be offered cut price deals or bursaries to try to secure their places. "The complication for universities is if you don't recruit the same percentage of students with AAB or better than you had last year what happens is you lose the funding for those students," he said. "That means those students become very attractive and thus institutions will do what they can to lower the cost of attending university in order to attract them." Sir Steve, Exeter University's vice chancellor, said many middle-ranking universities might reconsider their plans to charge the maximum fees of £9,000. Even those with low numbers of grade AAB students will get involved in the bidding war for those with top grades - because they will be seen as a kite mark of an institution's success, he added. 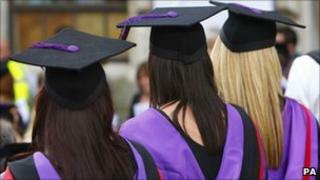 Under government proposals, universities in England will be able to take on as many high-achieving students as they wish, starting from September 2012. Shadow universities minister Gareth Thomas said a market could develop with all sorts of "hidden and unintended" consequences. "Money which might have been earmarked in the past to help students from disadvantaged backgrounds go to university is instead used to try and help recruit people with very good grades," he said. University finances would be destabilised as the system would encourage a "race to the bottom" on one hand and competition for AAB students on the other, he added. The general secretary of the University and College Union, Sally Hunt, said the introduction of a higher education market was "a recipe for disaster". "With teaching budgets being slashed by 80%, institutions are desperate to attract students to replace this lost income. "The government is obviously hoping that expanding places for students with AAB grades will lead to a bidding war and drive down costs, after it spectacularly botched up its sums on university funding. "I fail to see how moving from a system where there is collaboration between institutions to one which encourages cut-throat competition is in the interest of our sector." The Department for Business, Innovation and Skills said universities will need to meet tough new criteria for attracting the brightest students from lower income backgrounds, including offering fee waivers and bursaries. Who will benefit from the new school admissions code?